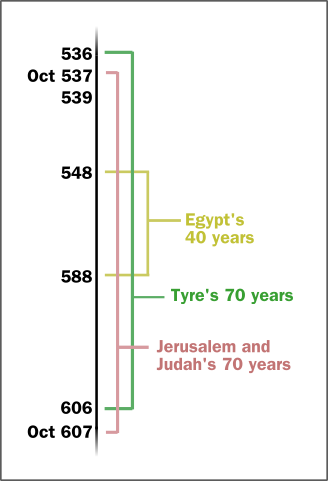 Here are the failed prophecies if 587 BCE is the correct date for Jerusalem's destruction. Jerusalem uninhabited and in ruins for 70 years. ). Alternatively, if the desolation ends in 537 BCE, the period is only 50 years, not 70. Alternatively, if the period began in 3rd year of Jehoiakim, the desolation is only 68 years, not 70, and whole passages of Jeremiah are wrong. No matter what argument is used, the prophecy fails. If 70 years begin in Jehoiakim's 3rd year of rulership, servitude lasts 68 years, not 70. If servitude begins in 609 BCE (secular chronology) with the defeat of Assyria, Nebuchadnezzar is not King for another 2 years, but prophecies state nations serve him and not his father; once King, servitude lasts 68 years, not 70. Tyre forgotten for 70 years. ). Only 50 years have passed, not 70. Egypt devastated for 40 years.
) and devastation begins in 568 BCE. Within 30 years Egypt has a King and holds a foreign alliance, and all exiles were released from Babylon, also Kingdom strong enough to rebuff Persian Empire. The 40-year period ends uneventfully in 528 BCE. However, the 607 BCE date fits all the chronologies and prophecies like a glove! It creates no contradictions, no failed prophecies, and requires no complex arguments or contrived explanations. All one needs to do is accept what the Bible plainly says, that 70 years is 70 years long. If 607 BCE is correct, then the desolation ends right on time in 537 BCE when the Jews are back in their cities. If 70 years begin in 607 BCE, servitude lasts the full 70 years. Nebuchadnezzar is King at start as prophecies stated.
) when Tyre provides materials for the new temple.
) and devastation begins in 588 BCE, ends exactly 40 years later in 548 BCE. A year later secular chronology records Egypt's King holding a foreign alliance.
) Anything Jehovah's Word foretells always comes true. On the other hand, not a single one of the 587-based theories creates such a perfect harmonization. In fact, all chronologies based on 587 cause massive contradictions, causes four prophecies to fail, and makes entire passages of Jeremiah just plain wrong. Worst of all, scriptural accounts which are perfectly clear and understandable, apparently require an expert to tell you what they actually mean. When the Bible says Jerusalem and Judah are both devastated for 70 years, it doesn't actually mean 70. When it says 40 years for Egypt, it doesn't actually mean 40. When Jeremiah said the land will be devastated, he actually meant it already was. When the Bible said the land would be without an inhabitant, it didn't actually mean without any inhabitants. When the Bible says all the princes were in Jerusalem, it didn't actually mean all the princes were there. When the Bible said Daniel was trained for 3 years before seeing the King, it didn't actually mean 3 years before seeing the King. When it said Tyre would be forgotten for 70 years until helping rebuild the temple, it didn't actually mean 70. And so on and so forth. We are strongly reminded of the tactics of Trinitarians, how they try to explain away clear words and tell you how “the father is greater than I am” actually doesn't mean that. The Bible simply doesn't agree with 587 BCE, and attempts to make it fit are contrived, complicated, and end up contradicting whole sets of scriptures. They use secular dates sourced from unknown pagan astrologers to over-ride the inspired writings of faithful Bible prophets, causing it's prophecies to fail; they go further and play with the word of God – inventing an exile that never occurred, just to suit their own ideas. It truly is a disgrace. On the other hand, we as Jehovah's Witnesses are determined to go with the whole Bible record and what it says rather than unproven writings of historians — who may or may not have an ax to grind and reasons to slant history to suit their own beliefs. Will you accept the chronology of the Bible and it's inspired prophecies – God's view – or, will you believe the secular chronology and the viewpoint of imperfect human historians and their Bible-contradicting dates? This essay and website has been researched, written, and created by brothers who, at one time, believed that 607 BCE was incorrect, and that 587 BCE was more likely. We read the claims of apostates, and were gullible enough to be taken in by them. After some time we realized that the promoters of 587 were not motivated by “truth seeking”, as they so often claim, but rather from an arrogant desire to simply prove the Watchtower Bible and Tract Society of New York wrong, and to prove themselves more clever or more righteous than Jehovah's people, whom they hold in obvious contempt.
) Now we see clearly that Jehovah's Witnesses are right, and 587 is wrong. There is a very popular book which advocates the 587 BCE date, written by an apostate with a disturbing cult-like following. To successfully draw people out of the truth, he promotes 587 to discredit the 1914 doctrine. He conveniently forgets to mention that 587 contradicts the Bible so much that it makes entire prophecies fail, of course. By putting on a false piety, pretending to be merely seeking truth, he has fooled many into believing the secular chronology. By using twisted methods of interpretations he even convinces many that the Bible supports this ridiculousness too! One woman who read his book (and left the truth being erroneously convinced 607 is wrong) remarked that she had “found the truth about the truth”. She then quoted Jesus in saying “the truth shall set you free!”, happy that she doesn't have to go to meetings anymore or preach as Christ commanded, as she is now more enlightened than the ignorant Jehovah's Witnesses. This concludes the main part of this essay. Please consult the Appendix for further reading.